Adrian Day has been managing portfolios at his eponymous firm since 1991. He manages in global markets with a specialization in gold and resources, always with a focus on long-term global value. He serves as sub-advisor to the EuroPacific Gold Fund (EPGFX). A graduate of the London School of Economics, Mr. Day has travelled around the world searching for opportunities. He is a frequent lecturer at conferences around the world, and has been interviewed on television and in the press, including CNBC, Wall Street Journal radio, Singapore Straights Times and many more. The royalty and streaming companies have a business model that offers far less risk than the mining companies while retaining much of the upside. Despite high valuations, they remain attractive investments. Business Development Companies traditionally offer high dividends. Right now, two of the best in the sector are offering safe yields of between just over 7% and 9.6%, Others, with yields up to over 10%, can be added to a basket of these companies. What are the causes and the effects of the policies of central banks and regulation on the economy and markets? Franco-Nevada Corp. is the bluest of blue-chip gold companies, an originator of the royalty model for the gold industry. Royalties, and their cousin streams, provide exposure to gold mining without the high costs and risks of mining. Largely overblown concerns have driven down the prices of Business Development Companies, so that several are now yielding in the double digits. Here, we recommend one trading at an almost 50% discount and yielding over 16%. That will be a future article. I did post the other day to buy Osisko. Will have others ahead. Investing in resource markets is quite different from other sectors–extreme cyclicality; very long cycles; huge corrections; continual mergers and acquisitions; and, huge capital needs. 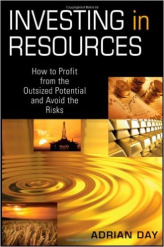 Written by industry pioneer Adrian Day, Investing in Resources: How to Profit from the Outsized Potential and Avoid the Outsized Risks details the factors that affect investing in resource markets, and how, if an investor understands those factors, the resource market can be a great place to realize very strong gains.